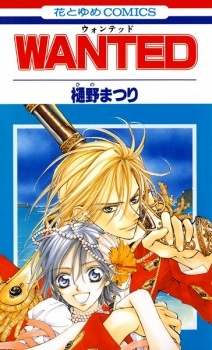 Wanted was published in English by VIZ Media under the Shojo Beat imprint on September 2, 2008. Don't expect this manga to be a deep, intricatly plotted out shoujo romance, it's just a light, fun read. The story may not be anything particularly special but it is fun. The main secrets of the book are told early on and the book is mainly made up of the pirate's adventures. It sort of reminds me of "Pirates of the Carribean" if it was a shoujo manga. Hino's art is fantastic, the characters and their costumes look great. Wanted is a good one volume work that might be worth your time if your looking for a light romantic shoujo manga to read. WANTED (the first three chapters) is just a standard lovestory mixed with Pirates. I give the story a seven. It is simple and standard, but that doesn't mean that it is bad. I loved to read something simple and plain. The art is beautiful and I give it a nine! I love Matsuri's art and thats why I've started to read this and her other manga's. Sometimes it is confusing, because it is sometimes unclear. The characters aren't that special. Armelia is just like every main character in story's like this. The same for Luce. There are also the same villains and so on. Six points. I even showed a friend who also read Vampire Knight a scan from this manga and asked her who the characters are. She said without hesitating that it were Yuuki and Zero. I thought the same, so the characters aren't very original. Overall, it is great! I enjoyed this manga and wished that it could be a little bit longer. A oneshot about pirates. More of a romance that an adventure, it's definitely a read for fans of Matsuri Hino. The pirates are believable and lovable, there's plenty of piracy in this volume to contrast the shojo-ness and it's fun to read. It's not for someone looking to find a pirate tale, rather for a shojo-fan looking for something a little different. It's not a common theme in shojo, so it's a refreshing new story that's re-readable. I was fascinated throughout the story…I'm quite a big fan of pirate stories…even more so when it involves romance. I truly wish that the story had continued…to satisfy my desire. Unfortunately pirate mangas are rather difficult to find…or at least a good one anyway.